The one thing Bridget Gleason knew, beyond a shadow of a doubt, was that she wanted to be a stay-at-home mom. She dreamed of providing her kids and her family with an incredible life. And then the universe handed her something completely different. When Bridget’s boys were one and three, her husband left—and she had no choice but to go back to work. So she interviewed for a sales position, negotiating a flexible part-time schedule in which she would be compensated based on performance rather than hours spent in the office. Motivated to spend as much time with her sons as possible, Bridget’s unanticipated status as a single mother afforded her a crash course in productivity. From this, she learned to prioritize the handful of to-dos that were most impactful. Going back to work also taught her to reframe the unexpected as a gift. She could have a rewarding career AND be a good mom. She didn’t have to choose one or the other. Today Bridget shares her resilience in the face of uncertainty, explaining how that process continues to this day. I ask her about the role emotions play in her work life and how she defies expectations to behave a certain way as VP of Sales. 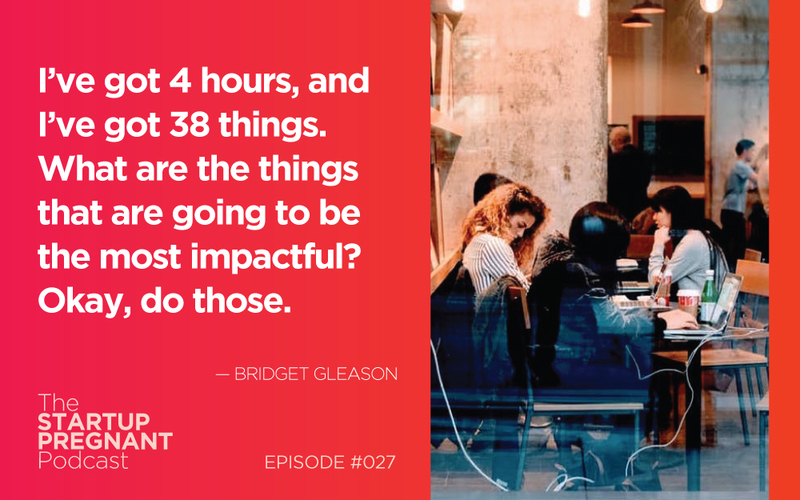 Listen in for Bridget’s advice around prioritizing self-care, ‘sharing the real’ when your kids are struggling, and reframing surprises as opportunities rather than obstacles. Bridget Gleason is the Vice President of Sales at Logz.io, the world’s most popular open-source log analysis platform. Her strengths lie in accelerating sales for startups and early-stage SaaS and PaaS technology companies, delivering significant revenue increases, forecast predictability and customer retention. An industry thought-leader, Bridget is a sought-after presenter at sales, leadership and women’s conferences. She is most recognized for her phenomenal success in building and leading high-velocity sales organizations. Thank you to the sponsor of this episode: Taskerly! They’re a virtual assistant company that helps busy parents and entrepreneurs get more done at work. They’re experts in doing the things you can outsource or don’t have time for. Check them out at www.taskerly.co and mention the Startup Pregnant Podcast to get 10% off of your first three months working with them.